Perennial herb from long rhizomes; stems erect, 40-90 cm tall. 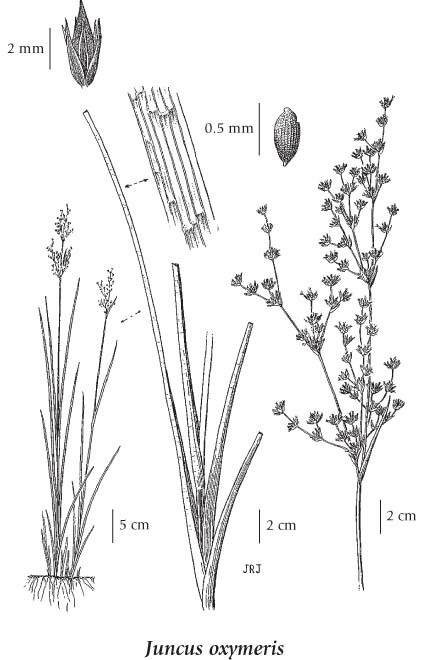 Located on the lower halves of the stem, 2-6 mm wide, strongly flattened, compressed laterally (iris-like), with partial cross-walls that run from the edge to about 2/3 of the leaf width; sheaths open, with minute, pointed, ear-shaped lobes. Inflorescence terminal, loose, with 10 to 70 heads, the heads mostly 3- to 12-flowered; perianth segments greenish-yellow to pale brown, 3-4 mm long, pointed, short-awned, subequal; stamens 6; anthers 1-1.5 mm long, slightly longer than the filaments; involucral bract much shorter than the inflorescence. Capsules, egg-shaped, tapering into long points, longer than the perianth segments; seeds ellipsoid, about 0.5 mm long, lacking tail-like appendages. Wet meadows and riverbanks in the lowland zone; rare in SW BC; S to CA.